Diamond can remove a range of waste from houses, gardens, offices and other commercial premises. There are a number of chemicals and materials that we cannot take though. Please contact Diamond Waste for more information. Diamond Waste, part of the Rubbish Clearance Ltd group, operates across London, Surrey and Kent. Click here for our London services. We are able to have a team of specialists to your site the same day. Our team arrange everything for you, including weekend collections if needed. We are an eco-friendly company: 100% of waste is diverted from landfill. Two man teams: Our trucks are always managed by two team members, allowing us to complete the job for effectively. 15+ year's experience: We are specialists in handling the safe disposal of waste. 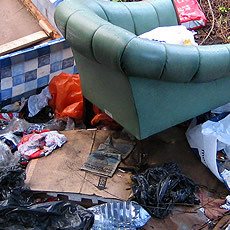 Call Diamond Waste on 0800 138 9100 to receive a free quotation.